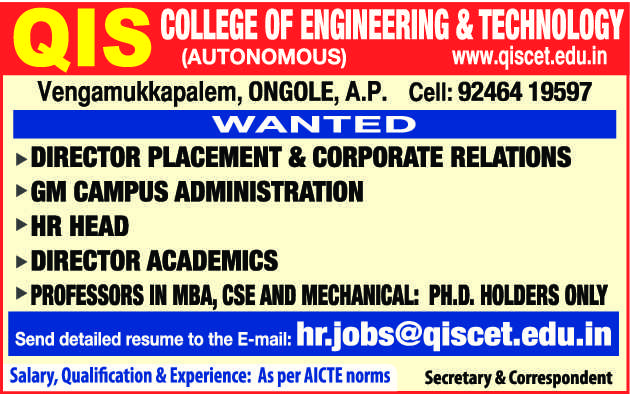 QIS College of Engineering and Technology, Ongole has advertised in THE HINDU newspaper for the recruitment of Professor / Director Plus Non-Faculty jobs vacancies. Interested and eligible job aspirants are requested to apply immediately from 18th July 2018. Check out further more details below. 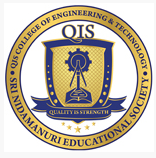 About College : The QIS College of Engineering and Technology was established in the year 1998, and sponsored by Sri Nidamanuri Educational Society to promote technological education to meet the requirements of a developing nation in the context of global concern at the threshold of the twenty first century. How to Apply: Interested and eligible candidates are requested to send application along with CV, certificates and recent colour PP size photos to the following email address.